Festival season is HERE and although I had to skip out on Coachella this year, I wanted to share a bit about a new hair kit that I wish I would have had last year! This post is written by me on behalf of Pantene. All thoughts and opinions are my own. 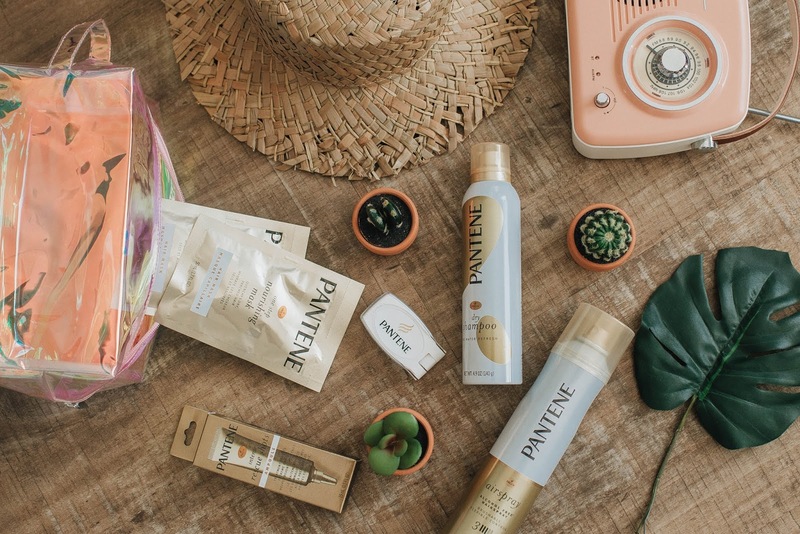 As the official haircare sponsor of Coachella, Stagecoach and Firefly, Pantene’s Festival Hair Kit has you covered for any festival (or any other event) throughout the year. There are so many details that go into creating an epic Coachella "look" and trying to keep up with your outfit, belongings and especially your hair can take away from enjoying the music and fun. 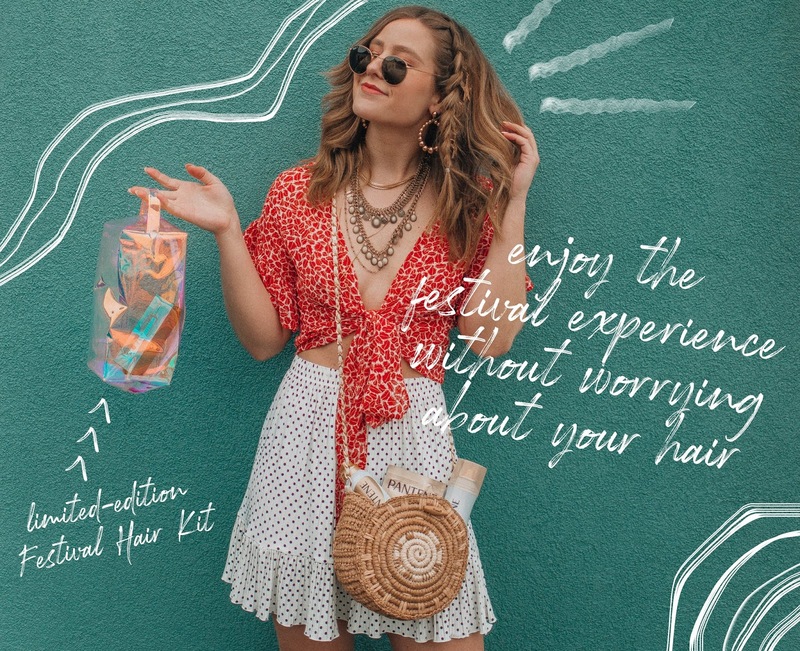 Pantene has created this amazing Festival Hair Kit to help you experience the joyful feeling of more great hair days even while enjoying a festival and avoid hair damage. 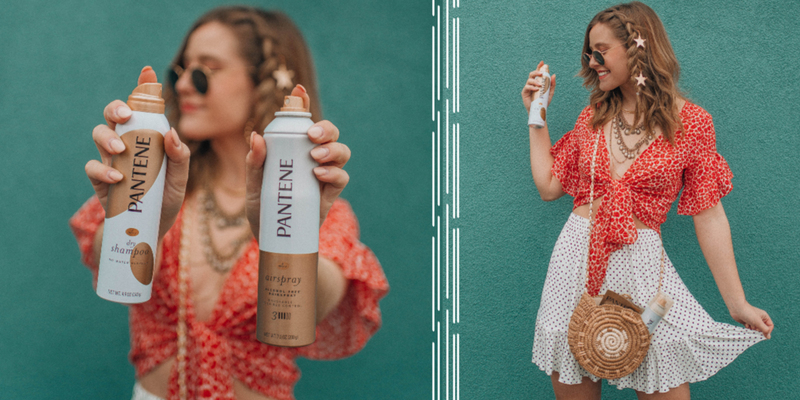 I remember last year I came back to the hotel with sandy dry hair each night and the Pantene Festival Hair Kit would have totally helped me enjoy the festival (before, during and after) and let loose without worry about my hair getting damaged! This Festival Hair Kit includes five essential styling products to get you through the weekend – before, during and after the festival. Dry Shampoo – instantly absorbs oil and refreshes hair without washing for a fresh and clean look, even on the second (or third) day ‘do. To use just shake, spray and rub into your hair from roots to wherever refreshment is most needed. On-the-Go Frizz Iron – it’s like a traditional flat iron, but without the heat, and controls frizz and fly-aways without heat or water. Simply close the Frizz Iron around your hair and glide it from top to bottom, it’s that easy! Airspray – this alcohol-free, “brushable” hairspray locks out humidity and adds shine for a strong hold and lasting frizz control. Spray evenly on dry, styled hair. Intense Rescue Shots – ideal for post-festival hair as it noticeably repairs extreme damage to hair in one use - this is Pantene’s first at-home rescue treatment imported from Brazil, and it is currently the #1 selling NEW treatment item across the haircare category. After washing your hair with shampoo, dispense the shot into your hand and apply onto damp hair, massaging from root-to-tip, targeting areas that see the most damage. Leave in for 30 seconds, rinse for 30 seconds. It’s that simple! Nourishing Mask sachets – delivers a nourishing boost of hydration to dry or parched hair. While in the shower, after shampooing, place a half dollar amount into your hand and comb mask into hair from mid-shaft to the ends. Leave on for 5-7 minutes or longer if desired. Rinse thoroughly after. Instant hydration boost and visibly healthier, shinier and stronger hair. My best hairstyle advice for a music festival would be to keep it comfortable! Try something new and funky but make sure you will be comfortable all day long going to events, sweating in the sun and dancing all night long! Braids can be a really easy way to switch up a simple hair look. I like adding a few hair accessories to the braids to elevate them just enough for a festival look!Get your own Festival Hair Kit conveniently delivered to your doorstep on Amazon.It’s also available for Prime Shipping!